Its been long since I posted. I have still not come out of the vacation mood yet. I had a nice long vacation last month, full of adventure – parasailing, river rafting, jet skiing, loved and enjoyed each and every moment. I am not a very adventurous person and was quite surprised about how much I enjoyed them. The icing on the cake was the quality time I spent with my little sis after almost more than 3 years. Back to the cooking again, I wanted to try my hand at bread baking from long time now. 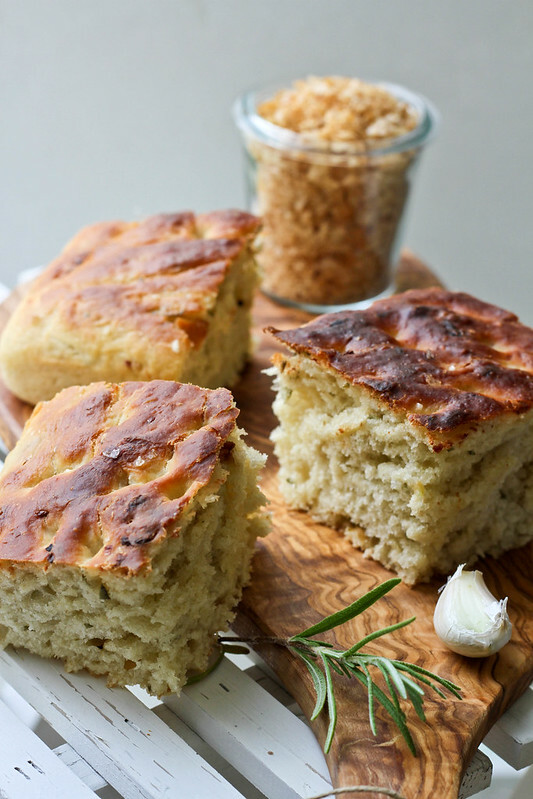 So I started by baking this simple and tasty roasted garlic and rosemary focaccia. It is full of flavor and tastes absolutely delicious with olive oil and pepper dip. To roast the garlic : Pre-heat the oven to 200 C. Toss the garlic with 2 Tbsp olive oil. Spread on the baking tray and roast till golden brown (10-15 mins). Keep aside to cool. Then coarsely grind using a mortar and pestle. 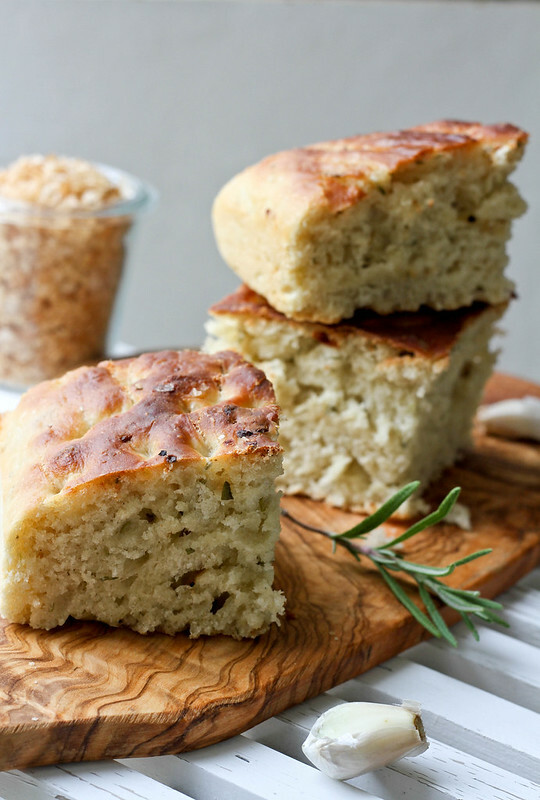 For the dough : In a bowl add in flour, honey, salt, rosemary, coarsely ground garlic puree. Dissolve yeast in 2 – 3 Tbsp of warm water and add it to the flour mixture. If using a stand mixer, use a dough hook attachment or using the hand mixer, mix the dough on low speed. Add in reaming warm water. Add in batches and add just enough till the dough comes together. Add in olive oil. The dough almost forms a ball. Place the dough in a lightly oiled large bowl, cover with a plastic wrap. Set aside in a dry, warm place and let it rise, for about 1 hour. Take a 30cm by 40 cm baking pan and coat it with 2 Tbsp of olive oil. Turn out down the dough onto pan. Lightly oil your hands and pull dough to the edges of the pan. Press it down evenly and poke holes all over with your finger tip. Cover and let it rise for another 15 – 20 mins. Meanwhile pre-heat the oven to 200 C.
Bake for around 30 minutes, checking in between, until golden brown. Let it cool slightly before serving warm or at room temperature. Yum! Lovely colour on that bread and love the flavours that you’ve put in. Great pics too! Enjoying a homemade freshly baked bread for dinner is satisfactory at every level. 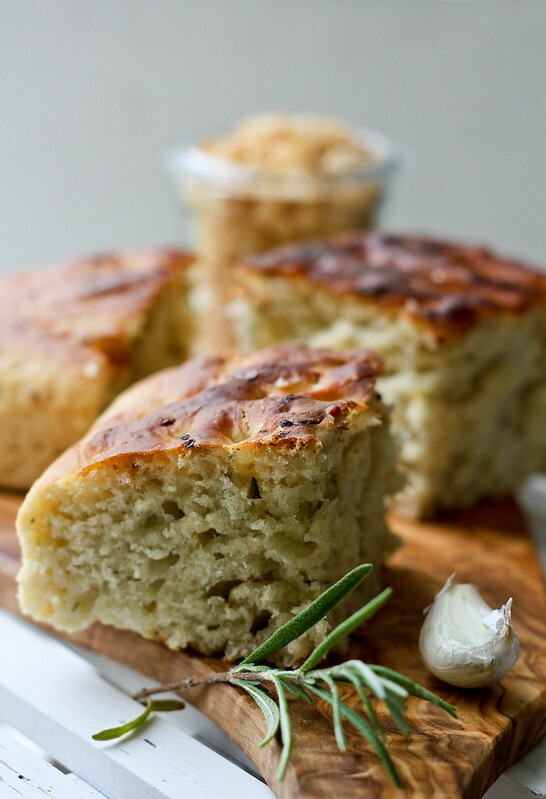 I love the addition on roasted garlic in the focaccia. very fluffy and apatising! looks great. 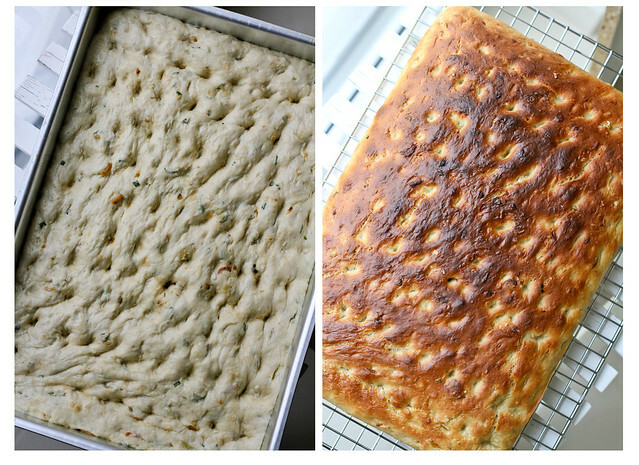 Beautiful texture and the Focaccia looks yum!